Coca-Cola might be a classic dividend play, but PepsiCo offers a much better mix of income and growth at cheaper valuations. PepsiCo (NASDAQ:PEP) and Coca-Cola (NYSE:KO) are both Dividend Aristocrats, meaning they have hiked their dividends annually for over 25 years. PepsiCo's streak has lasted for 45 years, while Coca-Cola's has lasted for 55 years. PepsiCo pays a forward dividend yield of 2.7%, which is lower than Coca-Cola's 3.5% yield. Based on those numbers alone, Coca-Cola looks like a better dividend stock. But investors should always look beyond a stock's yield to determine if it's a good income investment. Today, I'll explain why PepsiCo is actually a better dividend stock than Coca-Cola based on comparisons between the two companies' payout ratios, business models, growth trajectories, price performance, and valuations. Payout ratios represent the percentage of a company's earnings or free cash flow (FCF) that was spent on dividends over the past year. Lower payout ratios indicate that a company has room to grow its dividend, while ratios exceeding 100% indicate that the dividend could be cut. PepsiCo paid out 68% of its earnings and 57% of its FCF on dividends over the past year. Meanwhile, Coca-Cola paid out 94% of its earnings and 92% of its FCF on dividends during that period. PepsiCo's lower payout ratios indicate that it has much more room to raise its dividend than Coca-Cola. PepsiCo and Coca-Cola have very different business models. PepsiCo owns a diverse portfolio of 22 billion-dollar brands -- which includes sodas, juices, teas, sports drinks, bottled water, Quaker packaged foods, and Frito Lay snacks. Coca-Cola's entire portfolio consists of beverages and investments in bottling operations. Both companies have been affected by slowing soda consumption, which hit a 30-year low in the U.S. in 2015. Both also responded to the market shift by diversifying into bottled water, teas, sports drinks, and other non-carbonated beverages. PepsiCo has also been pivoting all its brands -- beverages and foods -- toward healthier "guilt-free" items. As for Coca-Cola, its lack of a packaged foods business has slightly throttled its growth, as we'll see in the next point. If a company can't grow its revenue and earnings, its ability to support or hike its dividends will weaken. PepsiCo posted 0.4% sales growth in 2016, but Coca-Cola's sales fell 5%. Both PepsiCo and Coca-Cola struggled with currency headwinds over the past year. That's why investors usually focus on organic growth numbers, which exclude the impact of foreign exchange rates, acquisitions, divestitures, and other one-time charges. On that basis, PepsiCo's revenue rose 3.7% for the year, and Coca-Cola's grew 3%. PepsiCo posted year-over-year organic sales growth in all of its business segments except Quaker Foods North America, which stayed flat. Coca-Cola posted positive organic sales growth across all four of its international segments and its bottling investments unit. For fiscal 2017, PepsiCo expects organic revenue growth of at least 3%, while Coca-Cola expects approximately 3% organic growth. On the bottom line, PepsiCo's earnings rose 19% (due to favorable year-over-year comparisons to its Venezuela impairment in 2015), while its core earnings -- which are comparable to its organic numbers -- grew 9%. Coca-Cola's earnings fell 10% as reported, but rose 5% on a constant currency basis. Based on these numbers, PepsiCo appears to be growing slightly faster than Coca-Cola. Price performance generally doesn't matter as much as dividends to income investors, but we should note that PepsiCo's 69% rally over the past five years crushed Coca-Cola's 16% gain. 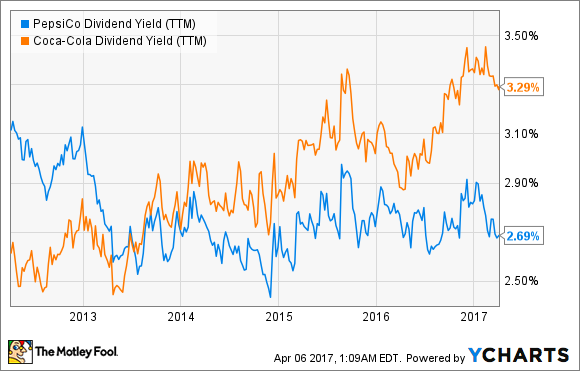 PepsiCo paid a much higher yield than Coca-Cola back in 2012, but the stock's rally caused its yield to drift lower. But even after that big rally, PepsiCo trades at 26 times earnings, which is still lower than Coca-Cola's P/E of 29 and the industry average of 31 for soft-drink makers. PepsiCo's price-to-sales ratio of 2.6 is also much lower than Coca-Cola's P/S ratio of 4.4 and the industry average of 3.1. These figures all indicate that PepsiCo is still a fundamentally cheaper stock than Coca-Cola. Coca-Cola has a higher yield than PepsiCo, but it also has a higher payout ratio, less diversified business model, higher exposure to sluggish soda sales, weaker growth, and higher valuations. Therefore, I believe that investors should accept PepsiCo's lower yield for its long-term growth and stability.